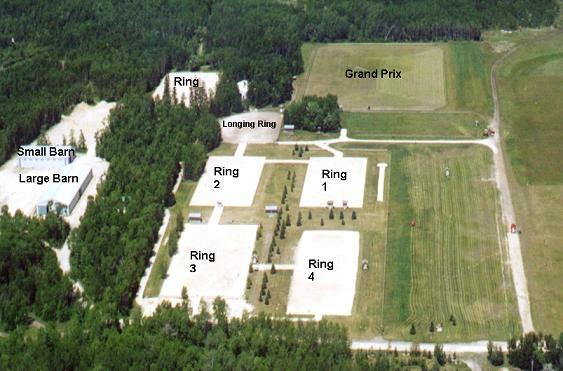 Manitoba Horse Council owns and operates its Equestrian Centre in beautiful Bird's Hill Provincial Park, Manitoba. Interested in booking the Equestrian Centre for an event, competition, clinic, or camp? The MHC Equestrian Centre is built on approximately 40 acres of land leased from the Provincial government. The MHC Equestrian Centre has undergone numerous upgrades over past years to ensure this 1967 and 1999 Pan American Games site remains current - not only to equestrian enthusiasts but to all who visit. The Manitoba Horse Council (MHC) Equestrian Centre is accessible to a variety of equestrian disciplines for use in hosting competitions, clinics, and camps. The Centre can accommodate such disciplines as Barrel Racing, Competitive Trail, Cutting, Dressage, Driving, Endurance, Eventing, Hunter/Jumper, etc. Eventing / horse trial competitors have easy access to cross-country courses of all levels located nearby in the park. Obstacles built for the 1967 and 1999 Pan American Games are also still standing. The nationally-rated Training, Preliminary, and Intermediate level courses were originally designed by former Olympian Robin Hahn! Driving competitors have access to the same area as Eventing competitors for Combined Driving Events. Endurance, Competitive Trail, and recreational trail riders have admittance to miles of wonderful trails throughout the park. Polo tournaments frequently take place on the field adjacent to the Centre. MHC also welcomes the use of its Equestrian Centre for other purposes. Such activies that could be booked and accomodated include dog shows, beach volleyball, etc. Other activities available in Birds Hill Park include camping, biking, hiking, running, swimming, rollerblading, picnicking and more, as well as various winter activities. The Birds Hill Park Ranch and restaurant are located immediately beside the MHC Equestrian Centre. The Birds Hill Park Ranch also features trail rides and a petting zoo. Birds Hill Park is also in close proximity to the town of Oakbank. Spectators at all equestrian events are welcome and encouraged. For a list of events taking place at the Equestrian Centre, see the Calendar of Events.